As youâ€™re reading this I can safely assume you own, or intend to own an android device. Android, like all smartphone OSâ€™s arenâ€™t the easiest on the phone's battery. Those who actually use the features of their device fully generally wonâ€™t see more than a day of usage. The Galaxy SIII has what is probably the best battery life on a smartphone that Iâ€™ve ever had the joy to use, however even the battery on this phone can suffer under intense use. I recently went on holiday, and knowing that Iâ€™d likely be using battery intensive tasks on my phone a lot throughout the day (e.g taking photos), with little time to recharge at home/hotel, an additional battery sounded like a good idea... And thatâ€™s when I came across the Official Samsung Galaxy S3 battery kit. Not only does it come with a battery, but also with a phone stand which actually charges the spare battery! This actual dock looks very smart, it comes in a glossy black colour and although made of plastic, still feels very premium. As mentioned, the device charges a Galaxy SIII battery without requiring the battery to be inside the phone. This is fantastic as it means you can essentially charge 2 batteries at the same time, one inside the phone and one using the dock. The dock has a single microUSB port on the rear. You have to provide your own microUSB cable as one doesnâ€™t come included (annoying, however you can grab one of these cables for a few pounds on somewhere like Amazon or eBay). The battery is placed in a hidden compartment that flips up. The piece of plastic that flips up to display the battery compartment can be kept up allowing you to place the phone itself on the dock and have it stand upright. This does mean that the battery compartment is open and in view which takes away from the premium feel slightly! The battery that comes with the package is the exact same model as the one that comes with your phone, so you wonâ€™t have any compatibility problems, and the fact itâ€™s a genuine battery means youâ€™ll enjoy the same great battery life as you do with the battery that came with your phone. 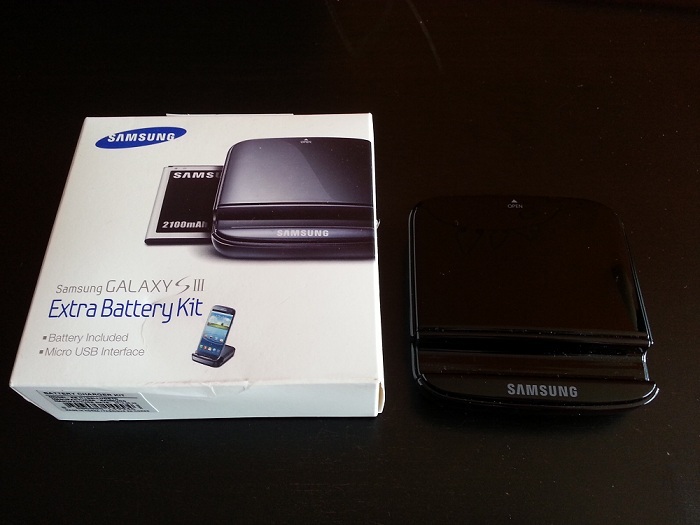 This is a great accessory for any Samsung Galaxy S3 owner that is wary about running out of battery. Two batteries really means more than a days worth of usage even for the most heaviest of users, and you canâ€™t really argue against that! Big thanks to MobileFun for sending over the SIII Extra Battery kit!